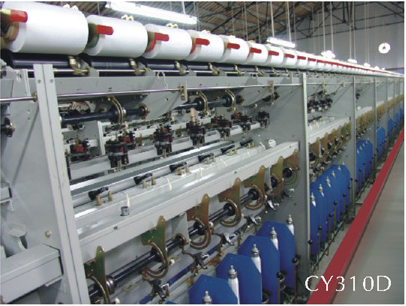 Heat Setting and Elasticizer False Twist Two-For-One Twisting Machine is a comprehensive machine which has the function of heat setting and elasticizer,can produce steaming fold filament after twisting the chemical fiber by one step. The temperature,twist and spindle speed can be controled by computer.All machine adopt LCD touch screen to operate.Temperature of each spindle can be seen and adjusted through the LCD.The precision can reach ±1°.There is an automatic alarm prompt system for too high and too low temperature.Each data for the machine while it is running can be seen in the LCD.The machine has high flxibility which can be used not only as ordinary Two-For-One Twisting Machine but aiso the automaticheat setting machine.The exhaust emission system can be installed when you need. Looking for ideal Heat Setting Two-for-one Twisting Machine Manufacturer & supplier ? We have a wide selection at great prices to help you get creative. All the Automatic Two-for-one False Twisting Machine are quality guaranteed. We are China Origin Factory of Intelligent and Flexiable False Twister. If you have any question, please feel free to contact us.